Next week is 2016's Lunar and Planetary Science conference - one of the big events on the space geek calender. It's a meeting for the top researchers, or at least those whose institution will cough up the price of a ticket. Talks and presentations cover everything from space dust to solar storms and planetary geology. But two worlds that always receive a lot of attention are Mars and the Moon - and this year there seems to be a lot of focus on the presence (or absence) of water and water ice. "HETEROGENEOUS WATER CONTENT IN THE LUNAR INTERIOR: INSIGHTS FROM ORBITAL DETECTION OF WATER IN PYROCLASTIC DEPOSITS AND SILICIC DOMES"
There's been a fair bit of talk over the last decade or so about the possibility of water ice at the Moon's poles, and the presence of a thin layer of water molecules spread across the lunar surface. 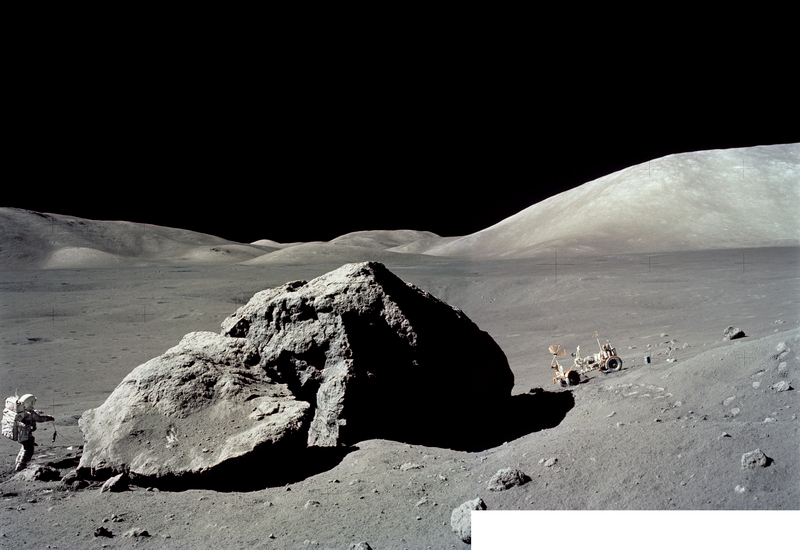 But this paper looks volcanic material, brought up from the Moon's deep interior, and finds it that some of it contains a surprisingly large amount of chemically bound water, which helps us understand the Moon's geologic history. "MINI-RF/AO BISTATIC OBSERVATIONS OF THE FLOOR OF CABEUS CRATER AND THEIR IMPLICATIONS FOR THE PRESENCE OF WATER ICE"
The Lunar Reconnaissance Orbiter has been probing the Moon's permanently shadowed craters with radar, and has detected signals that suggest the presence of ice in clumps roughly 26 cm in size, or bigger. However there's a question mark over the result, and the team cautions that more investigation is needed. "TOP HYDRATION LAYER NEAR POLES FROM LRO/CRATER: SEARCH FOR TIME-OF DAY DEPENDENCE." More results from LRO, this time about the top layer of lunar soil near the lunar poles. It's been known for a while that this layer contains a certain amount of H2O and HO, but now it's been seen that the amount of hydration varies with the time of lunar day. "CEMENTATION AND AQUEOUS ALTERATION OF A SANDSTONE UNIT UNDER ACIDIC CONDITIONS IN GALE CRATER, MARS"
The history of water at Gale crater lake is a complex one, but it seems to have included both episodes of 'friendly' PH neutral water, and episodes of much more acidic water. "CADENCE AND CAUSE OF LAKE-FORMING CLIMATES ON MARS"
The 'when' of lake formation on Mars poses a few puzzlers - it certainly doesn't look like they all formed at the same time, during the same period of clement climate. This paper looks at one possible explanation: That Mars has had repeated periods where the climate was suitable to form lakes. "THE NATURE AND EXTENT OF AQUEOUS DEPOSITS RELATED TO THE HALE IMPACT CRATER ON MARS"
A long time ago I read about the most likely way to get liquid water (in substantial amounts) under Mars' present day climate regime: Crash a big-ish asteroid into an ice rich area, and the resulting pulse of heat would melt the subsurface ice, leading to an underground hydrothermal system. And that seems to have been exactly what happened with Hale crater. "PERCHLORATE REDUCING BACTERIA: EVALUATING THE POTENTIAL FOR GROWTH UTILIZING NUTRIENT SOURCES IDENTIFIED ON MARS"
Definitely a speculative paper, but one backed by lab tests that suggesting that microbes which can make use of perchlorate salts - an abundant chemical on Mars - could subsist off the available nutrients on the red planet. A whole section on the discoloured sections of some slopes which, last year, were fingered as solid evidence of present day liquid on Mars. "ELEMENTAL COMPOSITION OF CERES BY DAWN’S GAMMA RAY AND NEUTRON DETECTOR"
Ceres may well have an ocean of mud deep beneath its surface. 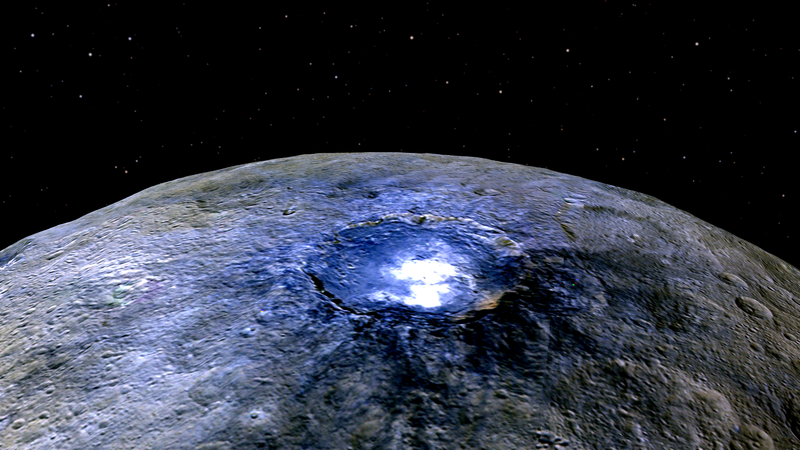 "IMPACT INDUCED HEATING OF OCCATOR CRATER ON ASTEROID 1 CERES"
Occator crater has been the site of the biggest of the mysterious bright spots, and also of some strange 'hazes' at certain times of the Cerean day. This paper looks at the possibility that heat from the impact that caused the crater created an undergraound hydrothermal water resevoir, and how that might relate to these phenomena. There's a hell of a lot more than that going on, the above ajust a taster. Expect some good bits of science and exploration to come to light in the next week!